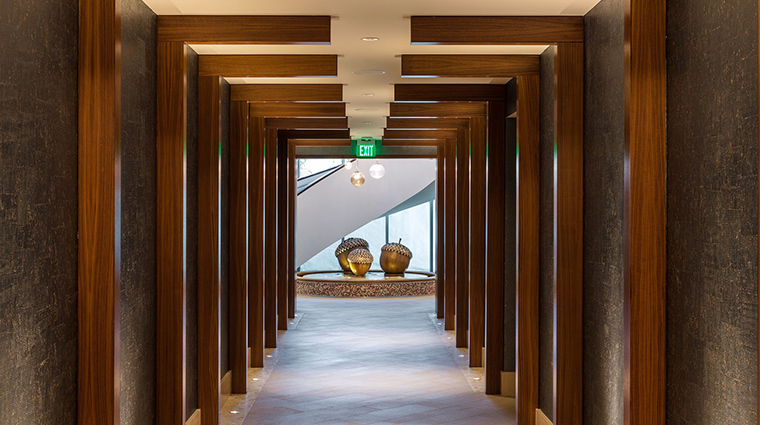 Nestled within the bustling complex that forms Pechanga Resort Casino, the all-new standalone Spa Pechanga offers a restful retreat designed to calm and rejuvenate mind, body and soul. Tranquility begins the moment you step inside the spacious waiting area. 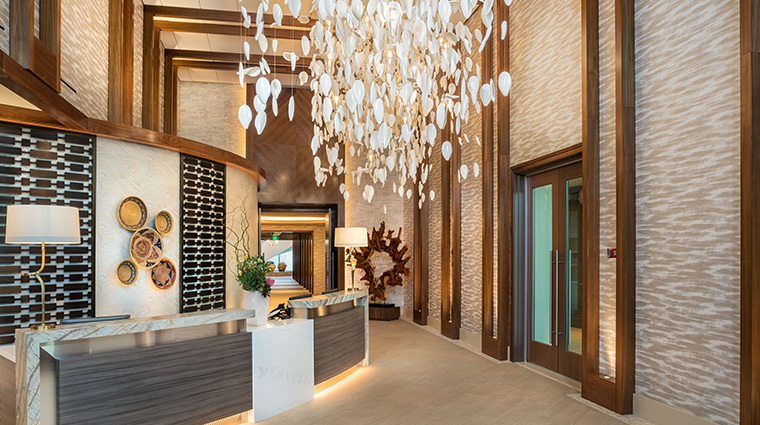 The lobby’s centerpiece, a serene installation of individual petal-like sculptures, hangs above, making you feel as though you are standing beneath a gentle shower of flowers. Lofty ceilings, massive windows and a comforting color palette create peaceful environs that whisper of good things to come. Awakening and nurturing all five senses is a common theme throughout the San Diego-area spa. Further inside the facility, more artworks await for a gallery-like ambiance that pleases the eye, while the soothing sounds of trickling water, uplifting aromas, fruit-infused beverages and plush furnishings dressed in the softest of fabrics create a completely immersive experience. The spa menu reflects a deep reverence for nature along with the healing properties intrinsic to botanicals. Treatments and rituals often include therapeutic herbs like lavender, white sage and rosemary. If you fall in love with the products used in your treatment, the onsite boutique makes it simple to take some home with you. The shelves are stocked with the Temecula spa’s high-end product lines. An upscale salon offers a full array of hair, nail and makeup amenities, along with an ample assortment of barbering services and mani-pedis tailored toward men. Designed for togetherness, the second-story relaxation lounge welcomes women and men alike with restful seating areas, light refreshments and a breezy open-air terrace with sweeping views of the surrounding mountains. With 25,000 square feet of sublime indoor and outdoor areas to enjoy, you can spend an entire day at this luxury spa. Don’t worry about parking. Simply pull up to the roundabout just outside the facilities and the complimentary valet service will take care of everything. If your desired spa day coincides with a weekend or holiday, be sure to book a minimum of one week ahead, especially during the summer months. The resort’s elaborate 4.5-acre pool complex known as The Cove is only available to hotel guests, but you can gain complimentary access with the purchase of any spa treatment. To take full advantage of the facilities, including the gym and wet areas, be sure to pack some workout clothes as well as your favorite bathing suit. For a youthful glow, indulge in the Transformative Trio facial, which combines three high-tech methodologies to revitalize complexions. The treatment begins with an exfoliating Hydrafacial, followed by rejuvenating Lightstim therapy and finishes with an oxygen-infused Intraceuticals session to plump and tighten skin. The Great Oak Purification is a popular body ritual that starts with aromatherapy, followed by dry brush exfoliation and a purifying clay wrap instilled with herbs. Your scalp receives a soothing oil massage as the clay works its magic, and once removed, you’ll be treated to a full-body Himalayan salt stone massage. Salon and spa services are divine by design, but those seeking extra pampering can augment their treatments by selecting additional amenities from the enhancements menu. For the ultimate bodywork experience, choose the Synchronized Massage enhancement and enjoy the blissful benefits of two therapists working in tandem. 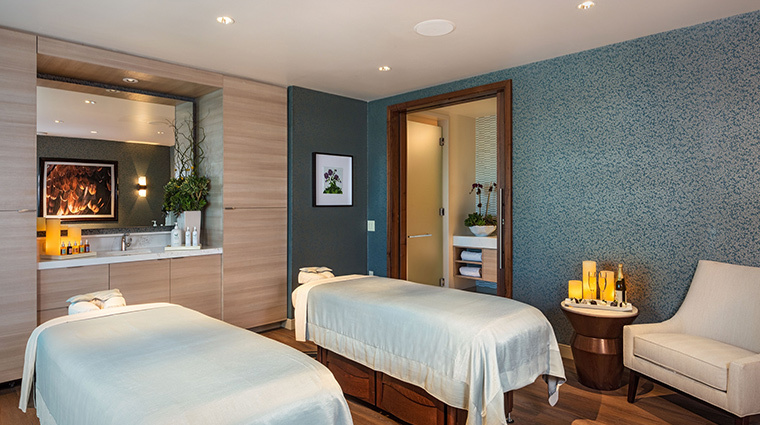 Couples seeking side-by-side serenity can receive their massage, body treatment or spa ritual in one of three luxurious Signature Suites boasting boosted amenities, superior floor plans and incredible views. To linger a little longer, request the Suite Retreat upgrade, which adds time to your stay along with chocolate-covered strawberries paired with champagne. 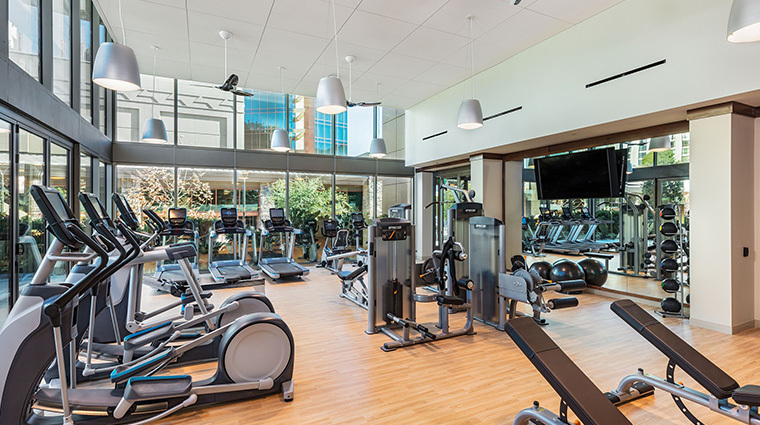 Set under a soaring ceiling, the spacious state-of-the-art fitness facility carries all the equipment you need, including two Peloton bikes. Walls of windows make the indoor spaces feel light and bright while the adjoining yoga patio provides a great place for practicing poses. 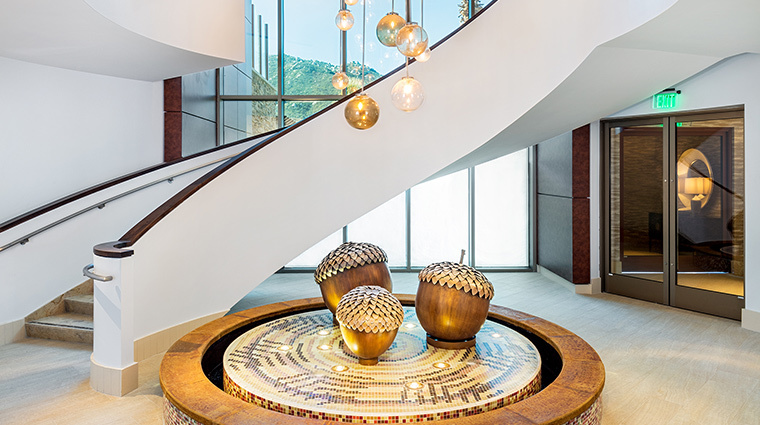 Connected by a stunning spiral staircase, Spa Pechanga presents two floors of creature comforts, including locker rooms, wet areas, 17 treatment rooms, multiple relaxation lounges and plenty of outdoor wellness patios. Both the men’s and women’s separate locker rooms and wet areas come well-equipped with tension-melting amenities such as redwood-lined dry saunas, eucalyptus steams rooms and hydrotherapy pools. For those seeking time in the sun, the dedicated spa pool presents plenty of opportunity to soak in some rays. To get even more time outdoors, opt for an alfresco massage in one of the poolside cabanas.